Three former jocists and sympathisers from the Diocese of Namur in Belgium have launched a new initiative to make Cardijn known to the present and future generations. Jean-Paul Van Steen and Philippe Hanseval are both former trade unionists while Lisette Degolla-Mombaers is a retired social worker, according to InfoCatho.be. 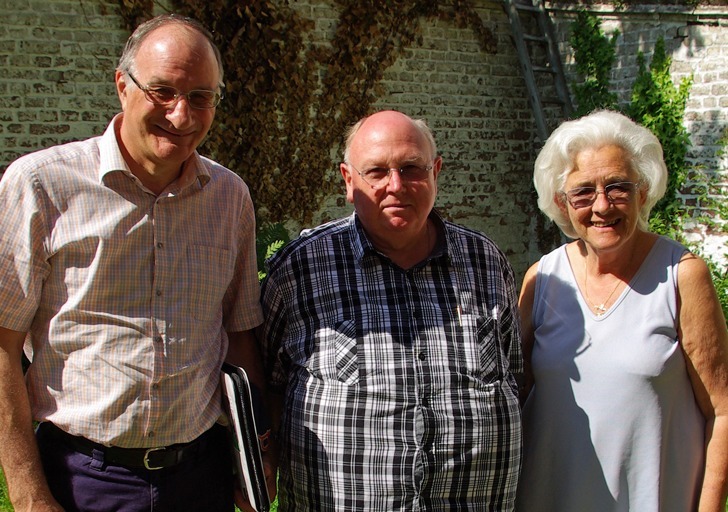 When Jean-Paul Van Steen (middle of the photo), Philippe Hanseval (left) and Lisette Degolla-Mombaers (right) mentioned this idea to Fr Jean Marchand, current chaplain of the Christian Workers Movement (MOC), he arranged for them to contact Namur Bishop Rémy Vancottem, who was himself the son of a metalworker. Bishop Vancottem took a great interest in the project, particularly since this year is the year of service (diakonia) in the diocese. He therefore proposed that the launch day at Beauraing on 18 October should also make mention of the Cardijn initiative. Jean-Paul Van Steen, Philippe Hanseval and Lisette Degolla-Mombaers have thus launched an appeal. In Flanders, a similar movement, “Vrienden van Kardinaal Cardijn” already exists. Other projects are also in preparation, including raising awareness in schools and religious communities, particularly women’s communities which often have many former jocist members. The Namur trio also plan to prepare information for the parishes of the diocese in order to encourage people to pray to the Holy Spirit for Cardijn’s cause of beatification.